There are dozens of chicken breeds. Some are popular for their egg laying capabilities and others for their extravagant looks. 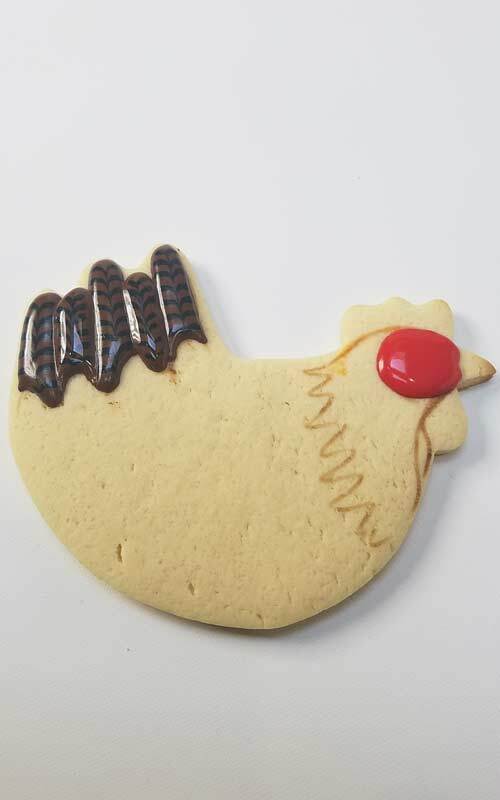 My Hen Cookies were inspired by an egg laying New Hampshire breed. There are over 19 billion chickens in the world. 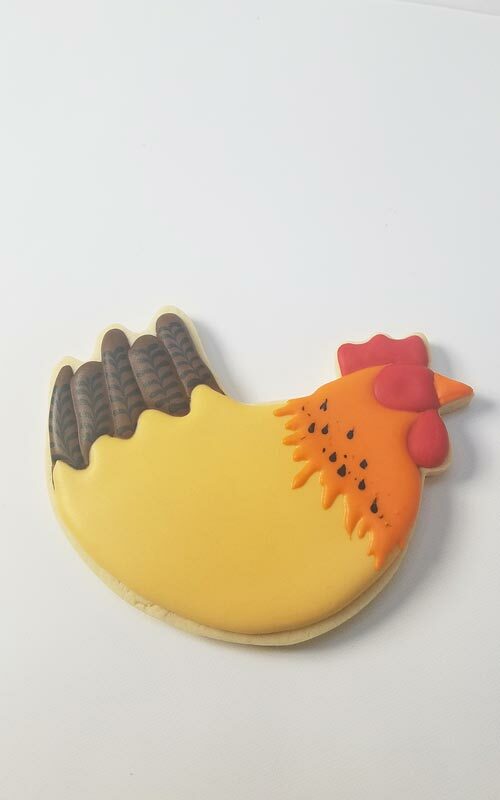 It’s about time I turned one of them into cookies. 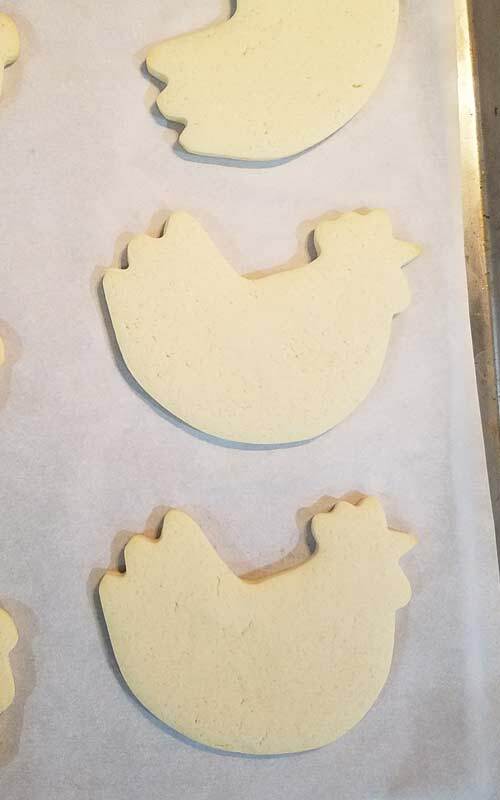 I had a hard time finding a hen cutter I like. Some were too small and others were too complex. But at last I found one I like. 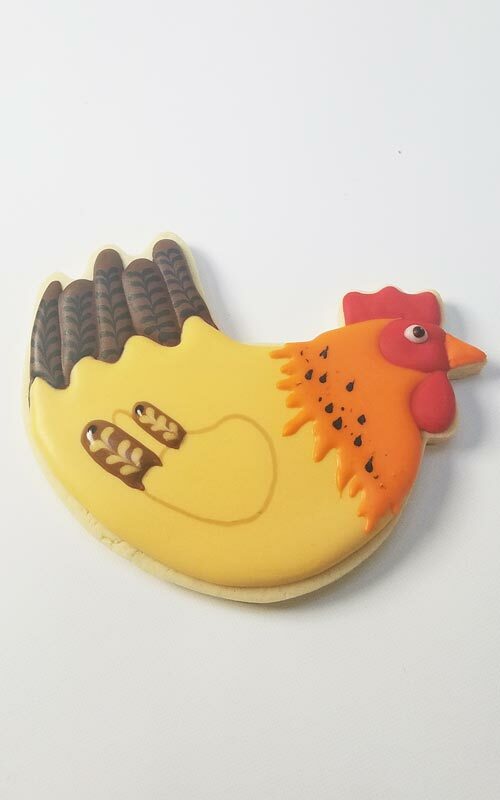 I picked up a Hen Cutter by Ann Clark. It’s a bit larger than most of my cutters. It runs 4.5 inches across. But I like that I could fit all of the design elements on there without making it too crowded. 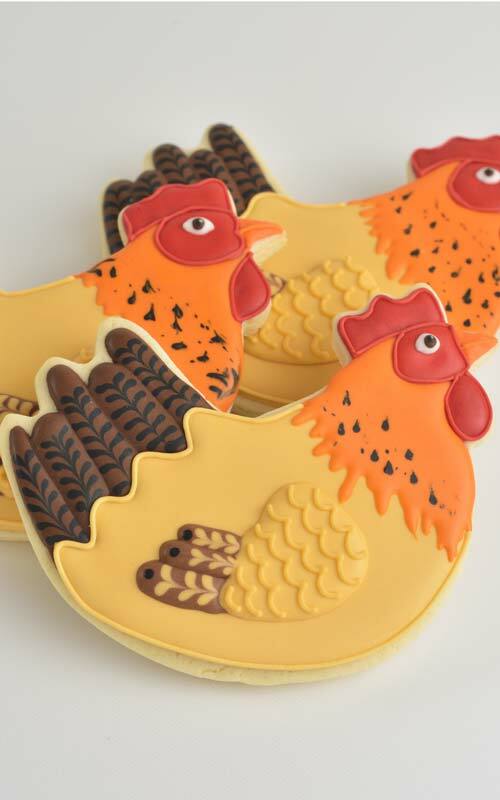 I used my Sugar Cookie Recipe and Fresh Lemon Royal Icing to make these Hen Cookies. Ok, let’s get started. At first glance this design may seem complicated. But once you break it down into sections it’s super easy. Divide cookie into sections. First, I drew guides with brown edible marker. I can’t stress this enough. It really helps to have the piping guidelines in place before you start decorating. Then with red icing I made the eye section. Then with brown and black icing I made feathers. I used wet on wet technique. You can see how it’s done in the video below. When making feathers it is important to ice every other feather and let them crust. After first set of feathers is crusted add the remaining feathers between. Make sure to let the icing crust well before flooding the breast section. And then let it crust again before adding hackles. While hackles section is wet use black icing to pipe dots into the wet icing. Immediately utilize a needle tool and shaped the dots by dragging upwards. Let icing crust again. At this stage you can pipe a comb, wattles and make an eye. If you haven’t made royal icing eyes before you can practice eye piping on a piece of wax paper. 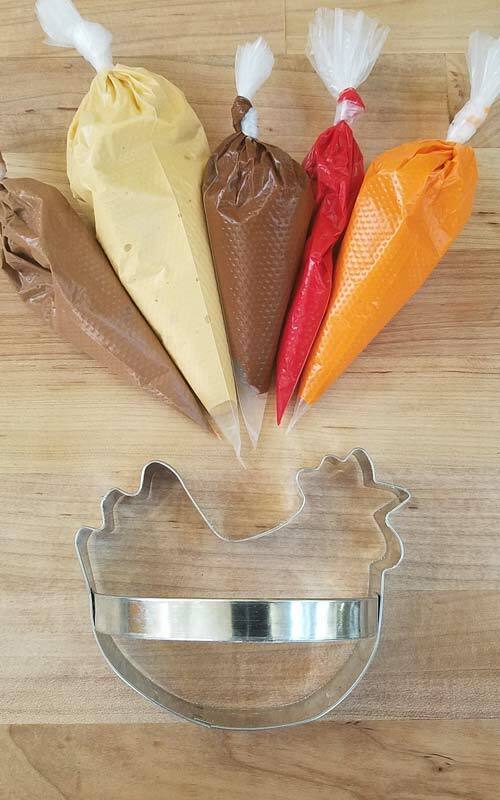 Let icing dry. Use edible marker to draw the wing outline onto dry breast section. Then pipe the wing feathers. Use the same wet on wet technique as with the rear feathers. Let all the feathers crust before flooding the remaining wing section. Let it crust and then finish with piping consistency ivory icing and pipe the scalloped edge lines across the wing. 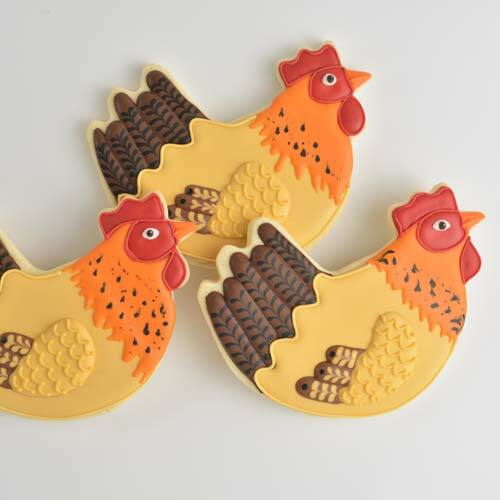 Perfect for a “hen party”😉 ! 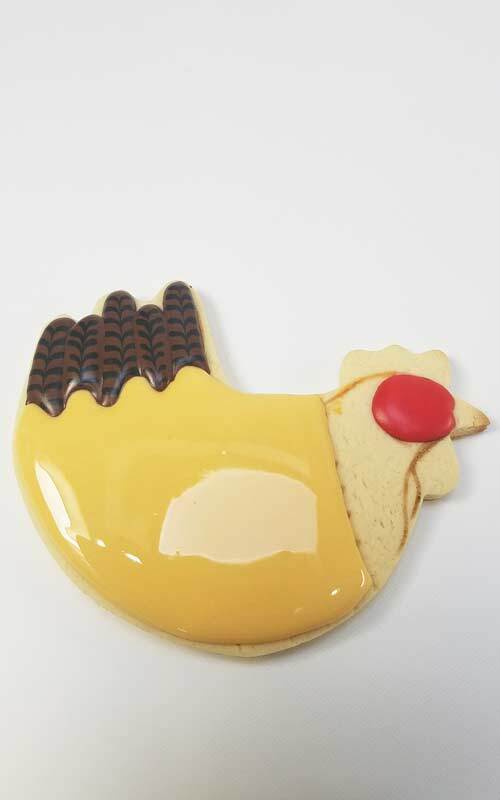 Cute cookies as always! LOL. You are too funny June. Love it.